Abandoned race tracks are some of the most eerily mesmerizing things there are. In a way, it’s beautiful to see the earth reclaim something its inhabitants couldn’t keep alive. But you know that not even the eery beauty will last forever, because eventually, there won’t be anything left. As a person who hunts these things down just to experience them one at a time, ghost tracks bring a feeling of sadness, nostalgia and wonder that nothing else quite can—you can almost hear the cars circling them from however many years ago, and you can vividly imagine all of the scenes the people who used to go to them describe. But you know that those cars will never be back, and you know similar scenes will probably never play out again. 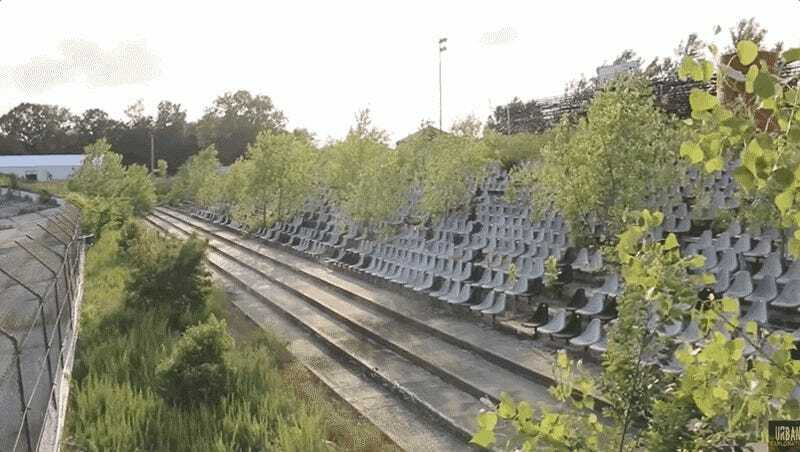 Below are some scenes from one of the hundreds of abandoned tracks across the U.S., the half-mile I-70 Speedway in Odessa, Missouri, which, as Vox Magazine reports, operated from 1969 until 2008. It was even a home track for former Monster Energy NASCAR Cup Series champion Rusty Wallace, according to Vox. It certainly looks like it has. Of course, this video turned up by The Drive includes some of the less-great aspects of exploring defunct facilities of any kind. The person filming this got hit by one of the many pieces of broken glass around the speedway, and found some gross, molded food. Either way, the video is a good reminder of what becomes of things when people give up on them. The same is true for hundreds of other ghost tracks in the U.S., and for plenty of others, bulldozers robbed them of the chance to ever become a ghost—and the chance at ever being resurrected.